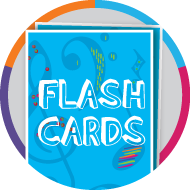 Flashcards are a wonderful way to teach music notes and symbols. You’ll learn your theory so easily! Simply clip out the pages out of the book or download the pages online. You have our permission to copy these pages up to 3 times ( giving you 4 of each card) to make larger deck for your own personal use. It's a great idea to laminate these pages and before cutting into the cards. This game can be played solo. You'll need 2 sets of cards to play this game. Place one set note side up and the other set note name up. Set the timer and see how long it takes to match the notes to their names. You can play this games with music symbols and or musical terms as well. If you really want to challenge yourself you can play this game with the whole set! This will be good for your brain as you will have to change between thinking about note names, Italian terms and musical symbols! Snap is an easy game just shuffles the cards. The dealer places one card down at a time on top the others. When two of a kind are next to each other the first player to snap their hand down and shouts "SNAP!" is the winner and takes all of the cards below back to their pile. The person with the most cards at the end wins. Place all the note flash cards (for a particular set that you want to teach eg all treble clef note cards/all bass clef note cards/all stave note cards) face up on the playing surface. Take turns in selecting a card per turn to line up 3 notes in a row. You can set time limits per turn to make it more exciting! Deal out 1 card per person. Place the remaining stack in the centre. Take turns in selecting a card. Decide whether this card is the note above or note below your current card. If neither you can add it to the discard pile or keep it to start a new group. Aim of the game to collect as many full sets of 3 in a row note piles as possible. 1 point is deduced for each card that is not part of a group. Once the card pile has been depleted. Turnover the discard pile and work your way through and repeat until all cards are gone. Starting at the top, reading left to right along each line. How many notes can you read in 10 seconds?